Being a Call of Cthulhu and Fate fan I have done few experiments with Mythos games within Fate games, namely Spirit of the Century, Dresden Files and lately with Strands of Fate. Though to ask if here were other fans of both, CoC & Fate, who might be so kind and give me some ideas on incorporating CoC experiences into Fate game. At the moment I'm doodling the" Strands of Mythos by the Gasligh", feedback is appreciated. For example Great Old One, cult and root form possible monsters I use Illuyanka dragon. I have done some of this, although in the end I went a different way for From Beyond, the game I'm currently writing. I think the biggest single questions are how you approach "sanity" and how you approach "magic". Everything else works out fairly easily, I think. These two are both definite matters of taste, and will make the biggest difference to how distinctive your solution is. At the moment for sanity I use the Strands of Fate structure, with list of Edges I did a while back, here. The base is solid, I need to lower the rating a bit to encompass these for the Gaslight style, as the characters are a bit fragile. Consequences handle insanities and sanity loss quite nicely, I think I will need to add few pages of theme linked suggestions to encourage style though. For Magic I have a bit problems at the moment, possibly the activation difficulty inducing mental stress plus books as the source of magic will prove itself to be the right way, but I frankly don't know. Would you mind pointing me to some more information on From Beyond? I personally have come to love all things fate and love to give feedback & playtest anything coming out on the system. There's not much available on From Beyond, because I'm still writing it! But there is a prototype document and character sheet you can download from this thread: http://www.indie-rpgs.com/forge/index.php?topic=31266.0 That version is no longer 100% up to date, but it's probably 98% so. Despite that being a Forge thread, this isn't really a Forge-style game in any sense, which is probably one reason it hasn't had a lot of attention there! But Dave Berg, who has given me a lot of useful feedback, asked me to do post there, and I was happy to comply. To avoid disappointment, I should reiterate that although this grew from a Fate-related design, the current draft has no FATE elements left in at all, apart perhaps from the extensive use of tracks. However, its treatment of sanity and related issues is different from any other published game, so it might yet be of interest to you. If you have any feedback, I'd be happy to hear it, either on that thread, or just PM me here at the forums. I wish I could give you something substantial from all the FATE-related thinking I did when trying to write a "Spirit of Cthulhu". Sadly, my hard drive is not giving up any secrets just now. But if I find anything, I'll send it your way. I've played a fair bit of Diaspora, SotC and Starblazer... for my group, FATE & Cthulhu would take some mental readjustment! Dresden Files' two dots of health levels are good for fragile investigators. "If it got its hands on me, I was dead." Avoid fights and spend fate points like water once you're in one. I'm also a fan of DF's smaller range of aspects: a High Concept, a Trouble, and five background aspects. Sanity is a really interesting question. Does it work like health or other stress levels? Is it tied to aspects? A new mechanic? While Call and Trail give relatively slow-burn Sanity systems, a system where you could be struck down mad at any Mythosy moment could be interesting; or some other departure from X of Cthulhu expectations. I've been listening to Yog-Sothoth.com's excellent Horror on the Orient Express audio sessions, once again, and it's got me wondering once again about how to hack Spirit of the Century / the Fate system for Call of Cthulhu-style horror. On the face of it, the system is a very poor fit for the genre, seeing as the former is known for superhuman player characters and extended, less-than-lethal combat systems, while the latter generally expects a level of harshness that goes beyond "gritty". But I think it could work. More to the point, I think it could be awesome. There are a lot of peculiarities to the Fate system that, if calibrated appropriately, should be able to produce a meaty, flavorful kind of brutality that would fit the Call of Cthulhu mind set better than the very oldschool BRP system. First and most obviously, the PC power level should be lower than the SotC standard. I'd go with "Good" quality PCs, meaning they'd each get a skill pyramid capped at the Good level (+3) and just 6 aspects. I think I'd also scrap stunts completely, since that would further lower the PCs' power level and save a hell of a lot of time in character generation (which, after all, needs to be quick in a high-lethality horror game), but the upcoming Dresden Files RPG might include genre-appropriate stunts that'll change my mind. Anyway, if stunts are out, then I'd use some variation on the stuntless SotC variant rules to give aspects a bit more utility. Another severe change I'm leaning towards would be to limit the fate point refresh to half the number of aspects, so PCs would start each session with only 3. Limiting players' narrative power is crucial to the genre, and it would also increase the importance of compels (and, therefore, encourage players to make more flawed characters than usual). However, I'd take some of the sting out this fate drought by letting PCs spend a "virtual" fate point if, in the course of the same action, they also take a consequence. That is, they have the option to take some physical or psychological sacrifice in order to give themselves better chances at success. After all, sacrifices (as a theme) and consequences (as a mechanic) are pure gold for horror games. More on that below. ...In fact, I'd say that consequences are so important that I'd remove stress tracks from Fate combat system all together. Yep, any shifts of damage inflicted on characters would either be converted into consequences or take them out of the fight (a variant originated, as far as I'm aware, by Colin Jessup for his Star Wars Fate hack). Minor consequence - Covers up to 2 shifts of damage. Goes away as soon as the character gets a few minutes' respite. Things like "bruised", "winded", and "shaken" would be appropriate. Major consequence - Covers up to 4 shifts of damage. Lasts until the character can get a serious rest--like a night's sleep--or some specific remedy is obtained. A physical major consequence like "bleeding" might be remedied by medical treatment, while an emotional one like "infuriated" or "humiliated" might require something like an apology from the party who inflicted the consequence. I think any remedy that doesn't require several hours of time ought to require some kind of skill check or story-based accomplishment. Severe consequence - Covers up to 6 shifts of damage. These would, by default, last until the character has a chance to get days or even weeks of downtime, but might be reducible to major consequences by some kind of skilled treatment. Broken bones and real mental trauma would fit this category. Also, I might deviate from the SotC rules a little bit by saying that a character who takes a severe consequence is taken out, just not permanently, and not on the attacker's terms. So, in that way, it would work a little like a concession. I'm a little bit torn as to whether or not the Endurance and Resolve skills should give characters in this system more consequence slots the way they give SotC characters more stress boxes. On one hand, I'd hate to devalue those skills, and the strategic question of whether to take a 4-shift hit as two minor consequences or one major one sounds like fun. On the other hand, I'm afraid it might make them--especially Resolve--too important. After all, Resolve is already rolled as an active defense against emotional and psychological attacks . . . and that's something a horror game should include a lot of. 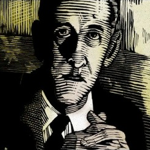 Arguably, the defining element of the Call of Cthulhu gaming experience is the sanity check. Any system trying to emulate this genre absolutely needs to include something along those lines. And, believe it or not, I think Fate already has a system which can that kind of thing beautifully: our good friend "consequences". Just let sanity-threatening situations make a psychological "attack" on characters (which would naturally be resisted with a Resolve check). Any consequences a character suffers as a result of such an attack could be states of fear or nausea or confusion, or the kind of colorful temporary (and sometimes permanent!) insanities familiar from good old Call of Cthulhu. And, of course, because the "death spiral" effect is also important, new shocks would get to tag the consequences inflicted by previous shocks. That is, if you're already shaken by the corpse you found in the street, you're all that much more likely to lose it completely when the thing gets up and lurches towards you. I'm not entirely certain, however, if sanity threats should actually roll to attack, or if they should just have a static horror factor that characters have to roll against. I suppose it's a question of just how much randomness feels right in play (and how much dice-rolling you want to do). I'm toying with the idea of letting very successful sanity checks create temporary aspects along the lines of "keeping cool", "ready for a little blood", or "facing the darkness". Like a kind of anti-consequences, these would show that the character is hardened or inured to certain shocks, and would be invokable for a Resolve check reroll or bonus when a similar situation comes up. They could even mirror consequences in their values and time limits. That is, getting 4 shifts on a successful sanity check would create a major anti-consequence (for lack of a better term) that would last the rest of the day. I could complicate matters further by having these things actually take up psychological consequence slots--so that they'd make you more likely to break more severely once something does manage to crack your defenses--but I fear they'd become a punishment for rolling well rather than a reward. Not too sure. Other than the elimination of stress boxes, I'm only envisioning rather minor changes to the combat system. Naturally, I'd have weapons grant bonus shifts of damage on a successful hit, as a whole lot of Fate mods do. I don't think I'd bother introducing any sort of armor rules (beyond the possibility for characters to invoke aspects like "bullet proof vest" or "squamous hide" on their defense rolls). I'd like to replace Fists, Weapons, and Guns with simple Melee and Ranged skills. Melee might continue to be a defense skill--but only against melee attacks--while Ranged might only be for attacking, and dodging ranged attacks might only be done with Athletics. I worry this could be a bit too harsh, though, since PCs in this variant would have far fewer skills than SotC PCs. I haven't really done any thinking about magic rules. There are a whole lot of Fate variants addressing that issue already, and even one specifically aimed at Call of Cthulhu-style magic, and I'm not sure it's really high priority to begin with. At any rate, I don't expect to have a use for any of this system-noodling any time soon, but it'll be worth looking at again when I've got a copy of Starblazer Adventures or Dresden Files in my hands.